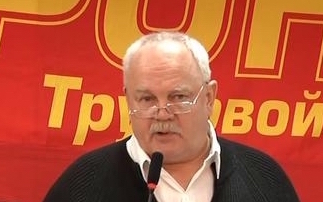 In an interview with 1st Secretary ROT Front of the Russian Communist Workers' Party, Central Committee member Viktor Tyulkin answered questions on the Russian elections and called Putin’s power play as a ‘bluff’. The interview was issued on 6 March on the official website of RCWP. Tyulkin mentioned that in the previous elections, Putin had promised that he would create 25 millions of Hi-tech working places, that productivity whould increase by 50%, that the real income of population would increase by 40-50%. However the results show that none of these targets have been reached. During Putin’s reign, the income of Russian workers has decreased by 5%. Moreover, the number of USD billionaires in Russia has increased from a dozen to more than a hundred while the list of billionaires is headed by Putin’s cronies. Concerning the weapons displayed by Putin to show off the military capacity of Russia, Tyulkin expressed that their development was started in Soviet times and ‘in particular it’s in favour of American hawks who can expect sharp increase in military spending’. According to Tyulkin, militarization of economy is used as a means to treat the crisis in Russia. ‘We wouldn’t be surprised to know that this part of election campaign was agreed with USA, possibly during the last visit of the head of Russian secret service to Washington. One can now raise an issue of USA interference in Russian elections’ he added.